Eltham is a suburban district of South East London, situated in the Royal Borough of Greenwich. It is notable for the quantity of green parkland, fields and woodland including: Avery Hill Park, Oxleas Woods and Sutcliffe Park. 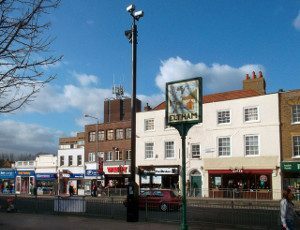 Eltham is accessible via the A2 and A208 road. Public transport links are plentiful and Eltham station takes commuters to London and back. Lanes School of Driving first started giving lessons in 1914. Its reputation quickly spread via word of mouth and today it is well established as a centre for excellence. Every pupil at Lanes is treated as an individual. Courses of instruction are specially tailored for each pupil. Lanes offers intensive driving courses as part of its curriculum. Theory classes can be taken along with practical lessons or separately as a theory course. When students pass their driving test they can continue their learning with a selection of after pass courses. These include: Parking Skills, Advanced Driving, Pass Plus, and Motorway Driving. Lanes appreciates that pupils lead busy lives. We are pleased to offer pupils complete flexibility in booking lessons to suit their schedules. Both regular weekly classes and single one-off lessons are on offer. Unlike some competitors, Lanes offers each pupil one on one tuition. We find that progress is much faster when the instructor only teaches one pupil at a time. Lanes has an excellent selection of modern cars for pupils to enjoy. Lanes allows pupils to be picked up from their doorstep and dropped off after their lesson. Lanes have been providing driving lessons in Eltham, London for many years. Please call us today on 020 8166 5678 or click here to send us an email via the contact page. Lanes has a team of over 40 driving instructors at its school. Pupils can select the most suitable instructor for their needs. Our instructors have successfully tutored pupils from age 17 to over 70. Nervous pupils will be reassured by our instructors. Each instructor is highly qualified and is registered with the DSA as an Approved Driving Instructor. Each pupil will retain the same instructor for the duration of all his lessons to ensure continuity. Lanes have a team of driving instructors in Eltham, London. Please call us today on 020 8166 5678 or click here to send us an email via the contact page. Some pupils are very apprehensive about learning to drive. Female drivers can be uncomfortable with the prospect of learning from a male instructor. At Lanes female driving instructors are available to all pupils. Our female instructors are excellent at putting their students at ease. Pupils will be encouraged to feel calm and unpressured during their lessons. Lanes have a selection of female driving instructors in Eltham, London. Please call us today on 020 8166 5678 or click hereto send us an email via the contact page. Many of our pupils have a preference for learning on automatic cars. It is certainly true that manual cars give the driver greater control. However automatic cars are less intimidating for many learners. They are far simpler to maneuver and they do not stall. Most students will learn faster in an automatic. Lanes have a selection of automatic driving instructors in Eltham, London. Please call us today on 020 8166 5678 or click here to send us an email via the contact page.